QuattroAir ResMed masks incorporate latest technology equipment featuring minimalist designs and delivering maximum comfort. 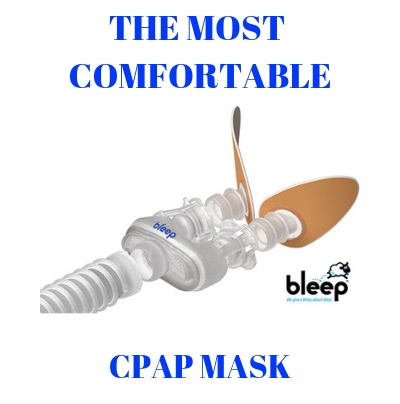 The ResMed Quattro Air mask for full face is an extremely popular choice among CPAP users. The mask is 45% lighter than the Mirage masks by the same manufacturer. The mask also features only 4 parts, making it extremely easy to disassemble and maintain clean and sanitized. Thanks to the advanced SpringAir cushion, the mask ensures a proper and comfortable seal in order to avoid leaks and loud noises. The ultra-lightweight frame and the comfortable cushion allow patients to enjoy a maximum efficient therapy each time. Includes only 4 parts- easy to disassemble and sanitize. This resmed Quattro air review will disclose to you even more features and details about this amazing mask. For example, the mask weighs only 3.3 ounces, being 45% lighter than other masks. Convenience, comfort and the best fit represent core features of this revolutionary design. Cleaning and maintenance is incredibly easy, thanks to the 4-part assembly. Superior comfort is further supported by resmed Quattro air cushion with SpringAir technology. The adjustment and stability are ensured by the flex-wing forehead support. Thanks to this feature, there is no need for additional forehead pads. The SoftEdge headgear improves patient comfort and reduces facial irritation. The circular diffuse ventilation system ensures that the exhaled air is directed away from the patient and his bed partner. The vent diffuse system is equipped with tiny holes being placed around the resmed Quattro air elbow. Therefore, noise is reduced at a minimum ensuring a restful night of sleep for both the patient and the bed partner. Patients also do not have to pull off the tubing, thanks to the one piece elbow assembly technology. This elbow is fitted with a swivel and also an anti-asphyxia valve which has tabs on each side. The patient only needs to press these tabs and the mask will gently detach from the tubing system. Quattro Air Full Face Mask + Headgear- what’s included in the box: a mask frame, the SpringAir technology cushion, the elbow and the headgear. The manufacturer has some clear recommendations regarding sizing of the Quattro Air Full Face Mask. According to ResMed the Quattro Air has the exact same sizing values as the Quattro Air Full Face mask. Therefore, if you wear the Medium Quattro original mask, you should choose the Medium Quattro Air mask as well. However, there are some sizing differences between the Quattro Air mask and the Quattro FX full face mask. In case you wear a Small sized Quattro FX ask, you should choose one size larger Quattro Air Mask. For example, wearing a Quattro FX in Small size, should have you choose the Quattro Air Medium size. Cleaning and maintenance of your Quattro Air full face mask: It is highly recommended to disassemble and clean your mask every single day. Check out the instruction manual to learn about the resmed Quattro air mask parts, and disassemble it accordingly. The mask has only 4 parts, so taking it apart should be very easy. You should always wash the headgear by hand, using a mild soap or detergent. Never use harsh chemicals, and never put the headgear in the dryer. Allow the headgear to flat dry instead on a clean towel for example. The ResMed Quattro Air for Her is actually the lightest full face mask available on the market, specifically designed for the finer facial features of a woman. The mask weighs only 3.3 ounces and it is up to 45% lighter than other masks in the same range. With only 4 parts, the mask is extremely easy to disassemble and maintain clean. Headgear included with mask. The mask is also irritating Latex free. Whether the Mirage Quattro Full Face Mask is much heavier than Quattro Air? Currently I am using Amara view full face mask but find the mask have leak when under high AHI pressure (12+). Is Quattro Air for Her can work well with high pressure. I try to select one among ResMed. The one I want is easy cleaning, light weight, and no leak. My size with Amara View is small. But I measure it with ResMed Template, I am on Medium size. Is there other thing I need to know or consider? Thanks. 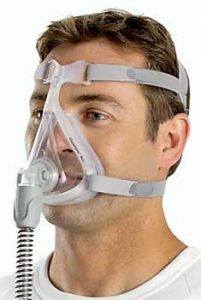 The ResMed Quattro Air is one of my favorite full face CPAP mask. It is light weight and very stable on the face. About half the weight of the old Mirage Quattro Full Face Mask. I believe you will find that it does not leak like the AmaraView. A for size we find that the vast majority of users are a size medium. I currently use a Airfit F20 for her, small . I would like to try a Quattro Air for her. 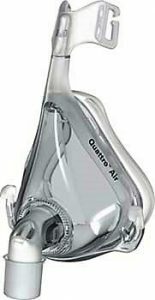 would I need a small Quattro Air or Medium? If you use the small ResMed AirFit F20 Full Face Mask you will also use the small in the Quattro Air Full Face mask.